WELCOME to SALOON CAFÉ DOORS! We are America’s number one source for unique and beautiful custom café doors with the highest standard of quality. We are sure you will find a style to match your décor from our distinctive line of café doors. Café doors may have several other names, such as swinging doors, saloon doors, bar & pub doors, or western doors. However one constant remains the same regardless of their names, café doors truly add a unique, welcoming and remarkably striking look and feel to any room or doorway they are installed and are a true and great piece of Americana! Café doors are the perfect alternative to installing a full sized door for a space that doesn’t require full privacy. Café doors are known for creating desired partial separation between two spaces in a more tasteful and creative means than what a full sized door offers. Café doors allow light and sound to pass through the doorway all while adding a touch of privacy with a plethora of beauty. ABOUT OUR PRODUCTS: All of our café doors come to you unfinished and ready to paint or stain so you can match your café door specifically to your décor. Most of our premade café doors come in three sizes prefit for finished door openings of 30, 32 or 36 inch widths. Our premade café doors can be modified to fit slightly smaller or larger door openings (please contact us for details). Each of our café door sets are stunning in their original state but we also offer them dressed up with a bit more pizazz by adding special accents lending them a distinctive character all their own. We offer three main categories of café doors. Our first category of café doors is our louvered line. The louvered café doors are made of an exotic hardwood that is akin in grain and color to red oak and Brazilian cherry, solid oak, or primed white hardwood. The louvers provide a nice lighter weight café door set that allows more light to pass through than non-louvered café doors all while maintaining some desired privacy or room separation. Our second category of café doors is our raised paneled line. These café doors are made of red oak and red oak veneers. These solid café doors are heavy in weight and have a great sturdy feel to them. The raised panel design of these café doors provides a contemporary styling for a more modern décor. Within this line of café doors you have the option of a flat top to the café door or a more traditional top with the contoured edge that is characteristic of café doors in general. Our third category of café doors is our custom handmade line. These café doors can be made of knotty-pine, cedar, oak, cherry, walnut, aspen, mahogany or nearly any other wood species you may be looking for. Our custom cafe doors are solid, non-louvered, doors that can be made to nearly any width and height you need. To futher customize your one-of-a-kind cafe door you can have any of our accents added, a stained glass window inserted or let us know what else you have in mind and we will work hard to make it happen. Additonally, you can choose from flat, rounded, or contoured top and/or bottom edges for your door. These solid café doors are heavy in weight and have a great sturdy feel to them. OUR STORY: We began our journey in 2003 born out of our craftsman’s life long desire to take something common and simple and make it unique and extraordinary. With 25 years of experience in doing just this, our dedicated and professional craftsman’s creative and meticulous nature directs him to look outside the box to deliver a customized café door that is not only distinctive but truly gorgeous. Each of our custom café door sets is a design creation of his very own that he alone assembles. His quality craftsmanship with café doors is only matched by our commitment to satisfied customers. We are here to assist you with your questions, from placing an order to installation of your café door. 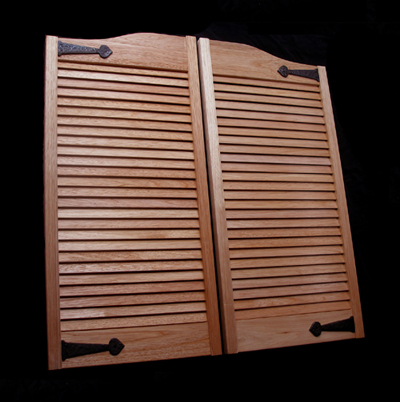 A Cafe Door are louvered swinging western doors that are used in saloons bars pubs restaurants taverns and even in residences. Cafe doors are great for dividing spaces. Cafe doors offer privacy without closing off an area completely. So think of using cafe doors or saloon doors when installing a new room divider.